The offshore walls and pinnacles show strong evidence of the currents that sweep through Dominica, with immense concentrations of gorgonia and sponge decorating the submarine volcanic surfaces. She was black and bold and full of attitude. Sharp-featured and unassailable. Vibrant. Dominant. Aloof. Sometimes she'd hurt me, and sometimes I would wish her out of my life. But in the summer of 1983 the illness came, and she left us all. We didn't know it then, but a void was created that could never be filled. Diadema antillarum, queen of the algae grazers, we miss you dearly — except of course in Dominica, where this long-spined sea urchin remains an integral part of the healthy reef ecosystem. It was a strange time when the Diadema died off in an epidemic that swept the Caribbean and the Florida Keys 34 years ago. Some researchers say dust that blew in from Africa that summer carried with it a pathogen that was fatal to this particular sea urchin. Others contend that the offending microbe was released from ships in the Panama Canal region. I remember cussing the Diadema for all the times they pierced my skin — sometimes through my wetsuit — when my eyes were focused elsewhere and not keenly aware of the urchins' omnipresence. Then one day on a dive I began to notice circular arrays of dark spines lying on the sand with dead and decaying sea urchins at the center. The blight virtually eradicated them, and the algae the urchins had kept in check began to overtake our reefs. Regrettably, coral reefs without Diadema became the new normal. offshore of Dominica helps keep the reefs healthy. I was diving along a deep pinnacle in Dominica recently, working my way to the shallows to offgas, and the top of the pinnacle looked somehow strange to me. Colorful sponge and other filter feeders decorated the top of the structure, but even the bare spots seemed to shine. Suddenly it occurred to me that I was seeing the substrate, the light-colored rock base that the corals and sponges had colonized. This rock, with no cloak of algae, was striking. Closer inspection revealed why the substrate could be seen: Scores of large Diadema grazed the reef. Not to overstate this particular anomaly of Dominica diving, but the presence of these urchins was another brick in the wall, protecting and enriching the local marine ecosystem and making these reefs among the most pristine and productive in the Caribbean. Lad Akins, director of special projects for the Reef Environmental Education Foundation (REEF), was on the island doing a fish-identification event the same week I was there. One night at dinner as we spoke about the overall splendor of the diving there, he drilled down to his particular area of interest, tropical fish, saying: "Dominica is one of the few places in the Caribbean where you can see a host of uncommon — even rare — species on any given site. Frogfish and seahorses are seen regularly, often on a single dive. Both spotted and stippled spoon-nose eels are commonly seen, and the lesser electric ray is the most frequently seen ray in Dominican waters, according to our REEF surveys — more common than stingrays or eagle rays. Add in batfish, flying gurnards, various pipefishes and numerous longsnout butterflyfish, and you have a truly amazing menagerie. The dive guides in Dominica know where and how to find them. It's a critter-lover's paradise." REEF divers are all about finding weird and wonderful fish. I found that diving Dominica changed the way I photographed reefs. On most Caribbean islands I tend to shoot mostly wide angle, taking advantage of the clear water and colorful decoration along the walls and shallow reefs. Here I settled into a routine of shooting wide angle on the first dive and then swapping over to 100mm on the second. Most of the boat trips are structured as two-tank dives with ample surface interval time in between to change a lens and a port on your housing. There was just so much I found compelling in the cryptic and bizarre genre that to restrict the visuals to only the vistas left a lot of treasure buried. This is a place to slow down and appreciate the balance of life, both large and small. Ramping up to this Dominica trip I reached out to longtime friend Michael Lawrence, a photojournalist with significant experience on Dominica. He wrote the Lonely Planet guidebook Diving and Snorkeling Dominica in 1999 and sent me a copy for this trip. I was surprised at how valid it remained as a reference, even 18 years later. Of course some of the nuts-and-bolts stuff such as "the tallest island in the Eastern Caribbean, Dominica reaches a peak of 4,747 feet," "the island is 29 miles long and 16 miles wide" and "more than 350 rivers … run down the mountain valleys" held true. Those are editorial constants. But I also found that his "Getting There" section remained surprisingly relevant and accurate. "There are two airports on Dominica. Canefield, north of Roseau on the west coast, serves smaller propeller airplanes. Melville Hall, on the northwest corner services jets and larger planes," the guidebook reads. "Though farther from most west coast hotels and guest homes, Melville Hall has taken over as the primary entrance portal, in part because it is the only flat area of land large enough to handle jets. There are no direct international flights into Dominica." Landing at Melville Hall, now called Douglas-Charles (DOM), used to mean a 2.5-hour drive on treacherous, winding roads to Dominica's capital and largest city, Roseau. Today the roads are much better, and the drive is just a little more than an hour. So that's different, but the "no direct international flights into Dominica" remains true almost two decades later and explains to a great extent why the island hasn't developed apace with the rest of the Caribbean. Cruise ships arrive in Roseau several days a week, but the masses of tourists that might stimulate high-rise development, golf courses or casinos have never materialized — much to the relief of those of us who prefer our islands laid-back, beautiful and pristine. Dominica continues to earn its appellation, the Nature Island. If it were easier to get there, that might not be so. A trio of banded butterflyfish forages amid the coral crannies. Fish nursery: This area just off Soufriere is a spawning ground for both pelagic and reef fish, and fishing is off limits here. Recreation area: Swimming and snorkeling are allowed off the beach at Tous Sable. Fishing priority: In a program of ongoing engagement with the local fishing community, there are defined angling areas with specific guidelines. Scuba diving: These areas are marked by mooring buoys that are to be used only by dive boats. 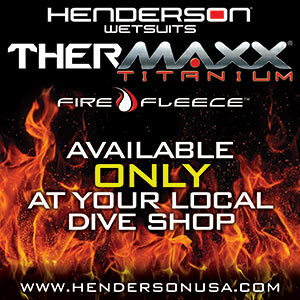 Government regulations require a licensed divemaster to accompany all divers. Shore access is often awkward given the rocky shoreline, so this restriction is not really a big deal. Currents are sometimes considerable, so this makes sense from a safety perspective. Small boat traffic to and from the various coastal villages is also common, which amounts to another good reason to dive with an experienced guide. Soufriere Bay is a submerged crater of what was essentially an underwater volcano. It's rimmed by the shoreline to the east and Scott's Head to the south. Its north edge is below the surface but provides giant underwater pinnacles that rise to within 20 feet of the surface. The west edge can be ignored, as it is way too deep for recreational diving. To the north of Soufriere Bay are more shallow sites adjacent to the shoreline. Here's a sampling of what I experienced during my recent visit in February 2017. Blackbar soldierfish are unusually abundant on Dominica. Swiss Cheese was one of my favorite dives because of the huge school of blackbar soldierfish we saw there. REEF's fish surveys of Dominica identify this as the fourth most commonly encountered fish in local waters, while elsewhere in the Caribbean they tend to be more rare, and they're almost never encountered in schools as vast as the one we saw at Swiss Cheese. French grunts often comingle with schools of other fish here. Providing dimension to the seafloor here are a shallow swim-through from 30 to 18 feet and a magnificent cloak of pillar coral on the site's massive granite boulders. Scott's Head Pinnacle is adjacent to Swiss Cheese and sometimes together are done as a single dive, although the area can be swept by enough current to make underwater navigation challenging. The local divemasters are very savvy in this regard though, so it is not something you would need to consider on your own. Not surprisingly, given its proximity to Swiss Cheese, the profusion of blackbar soldierfish continues within the archways of Scott's Head Pinnacle, and you can reasonably expect to spot a turtle here as well. Soufriere Pinnacles is the textbook definition of what is unique about Dominica diving. Three distinct pinnacles covered by sponge and crinoid rise from a 40-foot seafloor to within a few feet of the surface. While there was no current at all when I was there, the abundance of filter feeders suggests the region is often swept by current. L'Abym is a Creole word meaning "the abyss," and this site does indeed drop precipitously into the deep. This is similar to a traditional wall dive, and with the large orange elephant-ear sponge I sometimes felt transported to Little Cayman. But there are enough black coral trees, whip corals and gorgonian clusters to assure me this is the Eastern Caribbean. The Lawrence guidebook suggests this is a great macro site as well, but I shot wide angle that day, so my self-imposed blinders kept me from seeing the reef minutia. Among the surprises Dominica's reefs revealed was a large and pristine staghorn coral colony at Coral Gardens South. It is becoming so rare to see intact staghorn these days, so I asked my dive guide if the Coral Restoration Foundation had a project here. But this coral was not planted and is doing quite well on its own. I noticed certain species of fish that are fairly unusual in my home waters of Key Largo, Fla., but were quite common here. Whitespotted filefish (Cantherhines macrocerus) are often seen here in shallow water, as are a wide variety of hamlet, spotted drum, peacock flounder and cowfish. Spotted morays are also exceedingly abundant. Dangleben's Pinnacles is a perennial favorite for Dominicans (pronounced Dom-in-EE-cans — not to be confused with residents of the Dominican Republic, who are Dom-IN-i-cans). It features five pinnacles situated along the north edge of the Soufriere crater. The wild sponge formations suggest there is sometimes wicked current here, but incongruously this is also where I found a cute yellow frogfish tucked into a crack in the reef at 35 feet. For wide-angle work with models, the brilliant colors and contrasting cobalt hue of the water are quite inspiring. Nowhere was the old real-estate adage more apt than at Scott's Head Wall, which I found to be fairly drab and uninteresting. But splashing at Scott's Head Pinnacle and drifting to Scott's Head Point made for a beautiful dive. There dramatic sponge begin to appear as shallow as 14 feet, and the granite rocks are covered with all manner of colorful encrustation that reminded me of the British Virgin Islands. These sites are all adjacent, but turning the corner out of the bay (with the reef on the left), and heading along the dropoff toward the open ocean meant entering an area with much greater current flow and a far more dramatic seascape. I'd visited Dominica several times without ever diving Champagne, only because all the photos I'd seen were of a stream of volcanic gas bubbles rising from a flat and featureless seafloor. But now that I've seen it, I know there is so much more to this site. At 60 feet there are large schools of blackbar soldierfish as well as solitary creatures such as spotted drum and scorpionfish. Once you get to the shallows, the quantity of balloonfish (Diodon holocanthus) is quite astonishing. to dozens of resident balloonfish. Before lionfish had even arrived, the Dominica Watersports Association worked with our local Fisheries Division and REEF to put together a plan for how to deal with the expected invasion. We have created a huge demand for lionfish in our restaurants, which has encouraged local fishermen to treat them as another resource to harvest and sell. For our annual Dive Fest we put together an aggressive media campaign to educate the public about lionfish. We use cooking competitions to inform the island's people about the fish's great taste and ease of preparation. We visited fishing communities to educate fishermen about capture, cleaning and first aid in the event of stings. We also held a lionfish derby with local divemasters and visiting divers, and we donated all our cleaned fish to the local homeless shelter — a win for everybody. Diving in the south of Dominica within the marine reserve, you will find very few lionfish on our reefs due to our ongoing eradication efforts. On our most popular sites it is rare to see lionfish, especially large ones. However, as you visit more advanced sites — those exposed to currents or high seas and consequently not dived as often — you will likely see more lionfish. With minimal financial resources and very few dedicated lionfish hunters, Dominica has done an outstanding job of keeping our sites under control. Kudos to the Dominica Watersports Association, the Division of Fisheries and all our local hunters. all year round, diving to great depths to feed on giant squid. The sperm whales are resident here year-round because their preferred prey, giant squid, are abundant in the extremely deep waters just offshore. The resident sperm whales are mostly females, and during the mating season (December through March), the large males migrate and form social groups. Humpback whales, false killer whales, pantropical spotted dolphin and bottlenose dolphin are also likely to be seen during any given day while out searching for the sperm whales' distinct blows. While in-water encounters are possible only under permit and with an authorized guide, topside whale-watching tours are organized almost daily during the season when sea conditions are favorable. Although Dominica's diving warrants a visit on its merits alone, it is hard to contemplate traveling to Dominica without considering the amazing and diverse options topside. The island's volcanic nature means dramatic walls, pinnacles and reefs underwater and a visually diverse topside environment with unique activities for everyone. Dominica is one of the geologically young islands in the Caribbean, which means it stands tall with chains of mountains, lush rainforest and plunging rivers that lead to thundering waterfalls as well as gentle cascades. For the avid hiker, Dominica has the only long-distance hiking trail in the Eastern Caribbean, with 14 segments that span 115 miles. Some hikes are easy, while others are all-day adventures over ridges and rivers and through farms and villages. The most iconic hike is to Boiling Lake; it's a rite of passage for all who love Dominica and are up for the challenge. The journey takes at least three hours each way and leads hikers along high windy ridges, through various stages of forest and into a spewing, sulfurous caldron called the Valley of Desolation. Finally the trail emerges at a viewpoint overlooking the world's second-largest boiling lake. This hike requires a full day and should be done only after waiting the recommended 18 hours following diving (assuming multiple dives or multiple days of diving). It begins at 1,600 feet and crosses the peak of Morne Nicholls at 3,000 feet. For those interested in shorter walks, there are numerous waterfalls and river pools with hikes that take only 10 to 60 minutes each way, and these can done in the afternoon after morning dives. One of the best excursions is a trip to Titou Gorge, a narrow gorge that leads to a thundering waterfall. You will swim up the gorge with tall cliffs overhead and sunlight filtering down through the jungle vegetation. After passing through a large cavern, you can swim up to the base of the waterfall and feel its power. No matter which of these activities you choose, you can follow it up with a long soak in an all-natural volcanic hot spring with a cold local beer. Friendly people, great cultural events, pristine diving, unique topside attractions and beautiful views at every turn of the road define the Dominica experience. Getting there: There are no direct flights to Dominica from the U.S. mainland. Flights connect through nearby island gateways such as Puerto Rico, Antigua, Barbados, Guadaloupe, Martinique, St. Maarten and St. Lucia. Flights arrive at Douglas-Charles Airport, located about 70 minutes from the nation's capital, Roseau. Weather and climate: Expect temperatures between 75°F-85°F. The dry season is December to May, and the rainy season is primarily June to November. This is a mountainous island with many rivers, so runoff can degrade water clarity during the rainy season. Hazards: Many of the dive sites are subject to currents, which are variable in velocity. Typically the dive guides can read the current, and if it's too strong they will choose a more sheltered site. Occasionally they use the current to drift between two moored areas. Rather than fighting the current to get back to the mooring buoy, the boat drops off the divers and then moves to the next downcurrent mooring for the pickup. The guides are skilled at this protocol, but it requires divers to keep the group in sight. Driving is on the left side of the road. Be cautious of the deep drainage ditches along many of the roads. See more of Dominica in Stephen Frink's bonus online photo gallery and in the video below. Learn more about whale watching in Dominica at http://www.avirtualdominica.com/project/whale-watching/.